Chidiebere Nwakali was praised by his coach after the former Flying Eagles star opened his goalscoring account for Norwegian Tippeligaen club Sogndal Fotball. The versatile midfielder netted his first goal in sixteen matches in Sogndal's 1-0 win against Aalesund at the Fosshaugane Campus on Saturday, before he was sent off in the closing minutes for dangerous play. Reacting to his goal, Nwakali told Eurosport : ''It's great for me to score my first goal for Sogndal. I'm so happy''. Manager Bakke added : "I have challenged him to score goals. He has a sweet foot so it was time''. 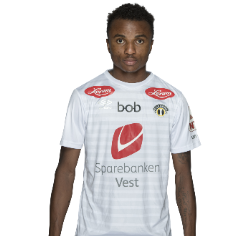 Manchester City loaned out Chidiebere Nwakali to Sogndal Fotball until August 31, 2017. The 20-year-old has yet to debut for the Citizens at any level due to work permit issues.